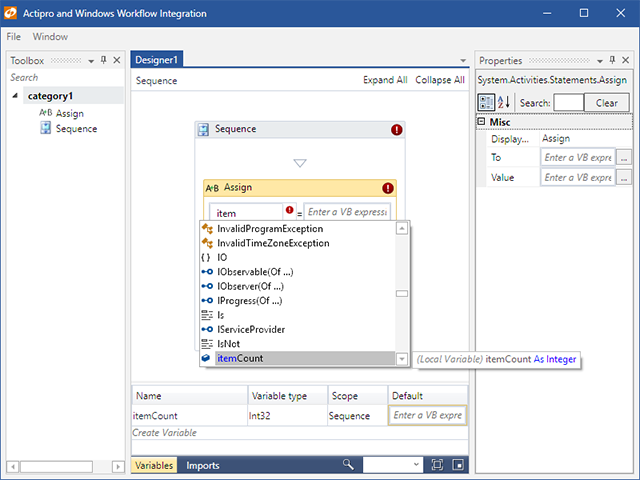 A while back, we created a sample for showing how a hosted Windows Workflow Designer instance could be integrated with Actipro WPF controls within a custom WPF application to provide a very elegant interface for end users. Our Docking/MDI product is used to provide the tool window and multiple document interface. Our SyntaxEditor code editor control, in single line edit mode, is injected as a custom expression editor. When you combine SyntaxEditor with our .NET Languages Add-on, you are able to have it support powerful IntelliPrompt completion lists. For instance, in the screenshot above, you can see the itemCount variable is showing up in the completion list since it was declared below. Our Themes product is used to provide a modern Metro style for all Actipro and native WPF controls. When you put it all together, it's very easy to integrate Actipro WPF controls with rehosted Windows Workflow Designer instances in your applications. It only takes a few minutes to get up and running, and once you do, the result is well worth the time.